With respect to the Twitter accounts @gota_kun and @tower_hanbai, the Facebook accounts @goryokaku.tower and 五稜郭タワー販売部, and the Instagram account @goryokaku_tower, which are operated by Goryokaku Tower Corporation (hereinafter referred to as the “Account”), we have the community guidelines stated below (hereinafter referred to as the “Guidelines”) for better communications with our customers. You are required to agree to these Guidelines before using the Account. 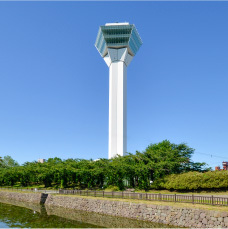 Goryokaku Tower Corporation (hereinafter referred to as “we”) will deliver various contents, including information for our activities and products. Sometimes, the contents may be delivered at other times. The Account is subject to termination or deletion without prior notice. Information posted from the Account, return mails, retweets, follows, links to other pages, and other various types of reactions are not always consistent with our official position, so kindly be advised in advance. For our official position, see our website. We will not reply to all comments posted to the Account. We will not answer any inquiries by direct message. If you have inquiries, opinions, or comments about us or our products, please notify us by using the contact on our website. We will not follow all users who have followed the Account. Meanwhile, we may follow any user who does not follow the Account. We do not warrant the correctness and completeness of the information on the Account. We do not assume any responsibility for comments posted by users. We do not assume any liability for any damage that may be incurred by users from using or being unable to use the Account. We do not assume any liability for any damage that may be incurred by any user or third party from any trouble between users or between a user and a third party in connection with the Account. In addition to the above, we do not assume any liability for any damage that may be incurred by the user or a third party from anything related to the Account. Copyright and other rights to contents posted by a user belong to the user who posted the contents, but upon posting, the user grants us a nonexclusive license to use (and reproduce, process, translate, extract, and publicize) the posted contents worldwide free of charge and agrees not to exercise the copyright against us. The Account is operated under the systems of Twitter, Inc., and Facebook, Inc., and we cannot answer any questions about the status of system operation of Twitter, Inc., and Facebook, Inc. Besides, we cannot answer any questions about the functions and use of software and applications provided by the Twitter site, Twitter, Inc., Facebook site, Facebook, Inc., or third parties nor other technological questions. We may revise these Guidelines without prior notice. Please refrain from the following acts on the Account. If we find any of the following acts, we may block an account from which such act is posted and/or terminate the account. Other acts equivalent to the fraud defined by Twitter, Inc., and Facebook, Inc. These Guidelines shall be governed by the laws of Japan. Any dispute arising in connection with the Account shall be submitted to the exclusive jurisdiction of the Hakodate District Court in the first instance. If you have inquiries or opinions about us, please notify us by using the contact page on our website.